Alexis Droy was born in 1973 and started his musical education at Nice Conservatoire with the study of the piano. 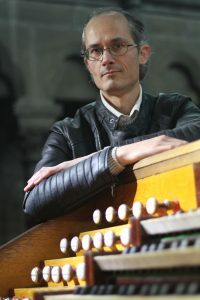 He then joined René Saorgin’s organ class and won the first prize in 1993. That same year, his training in composition with Jean-Louis Luzignant was also crowned with a first prize. In 1994, after perfecting his skills for a year with Francis Chapelet, he won the Medal of Honour of the City of Bordeaux. Finally, he joined the Toulouse Conservatoire to study with Michel Bouvard and Jan-Wilhem Jansen. A unanimous jury awarded him a Gold Medal (1995) and the Prix de Perfectionnement for organ (1997). He performs in various ensembles: orchestras (Orchestre National du Capitole de Toulouse, Orchestre d’Auvergne), piano and voice, flute and organ, choir and organ…and takes part in several festivals as a soloist. He served as the second organist on the Cavaillé-Coll organ of the Basilica of Saint-Sernin in Toulouse from 1997 to 2001 and is now the main organist on the Joseph Merklin organ of Moulins Cathedral, an instrument of great refinement and rare authenticity. He has recently recorded an album featuring Mendelssohn and Vierne which will be released in May 2018. Alexis Droy is a qualified teacher (CAPES, Diplôme d’État): he teaches music theory, composition and the organ at the academy of music in Moulins. He is frequently asked to compose and arrange music for various music groups and ensembles: symphony orchestras, wind bands, big bands, women’s choirs, brass instruments and organ.